The Lares Trek was a short and sweet start to our adventure in the Peruvian Andes. It was just three days long and with the elevation only between 3,500-4,500m it gave us a nice gentle chance to acclimatize. We started with a three hour drive with a short stop in Calca to hit the market. Our guide, Guido, suggested we get some small toys or trinkets to give to the kids we’ll come across along the way. This was good advise as it provided a chance to give the kids a bit of joy and some nice photo-ops. The trek did start on a peculiar note however… we started at a hot springs. Usually, I would think this to be something to put at the end of a trek, but we didn’t put up much of a fuss. After lunch we walked along the dirt road to Huacahuasi (Wakawasi). 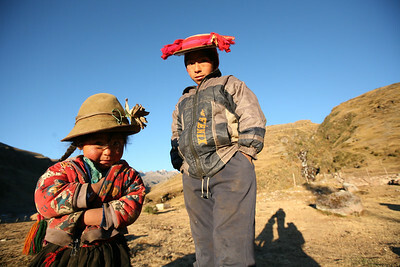 They’re finishing a trail on the other side of the valley, so future Lares Trekkers won’t have to walk along the road. Though, by doing so, they might miss out on some of the fun cultural encounters we had. Like the little boy with the stick and wheel that Dave was keen to try out. It’s all in the photos and video taken of this trip. Huacahuasi, which translated from Cechwa means “Cow’s Home” as it was once a thriving bovine center, has since traded the cows for the indigenous llamas and alpacas. This was also where we got some of the best stargazing on the trip. The town has electrical power, but there are hardly any exterior lights to pollute the sky. The next morning we played some soccer with the kids at our camp and Guido arranged for a visit with the local school, where we played more soccer before the kids had to line up for their classes. Dave had a good chat with some of the teachers (translated through Guido) as he’s a teacher himself. Our hike out of the Huacahuasi valley took us up to some beautiful rolling hill highlands which offered spectacular views of Nevado Sirihuani (Siriwani) – 5,359m and the Nevado Chicon – 5,530m range. We had our snack on the shore of a small pond then proceeded over the 4,450m Abra Ipsayjasa (pass) and dropped down to Laguna Ipsaycocha (lake) where the crew had the dining tent up, the table set complete with table cloth, napkins and warm oregano bread, ready for lunch. Soup, rice, veggies and a meat dish were soon to follow and it, like all the meals on these trips were delicious. Clouds were brewing around us and finally dropped a few small pieces of hail. Nothing to make us scramble into the tent though. Margarita, one of the herders wives, and her young daughter came up from their humble home just half a kilometer or so from our lunch site to set up shop and show us her knitted products. After lunch I had a look and picked up a coin purse, what will probably become a small table runner and a belt. Rob and Dave dove in as well and got a few small things before we continued on, passing her home and continuing down the Ipsaycocha valley to the much larger Ocororuyoc valley in which the small town of Patacancha sits – our destination for the night. We were camped right next to a dusty soccer field and it didn’t take much to get a bunch of kids together to get a full field game going. As expected some of the kids were quite good and gave those of us from the trek (Guido, Rosalio (our cook), Royer (asst. cook), Dave and Cameron) a good challenge. It was just starting to get dark (like, really dark considering the sun disappeared from the deep valley as we were arriving into town) when we called it a game and Rosalio started on dinner. We were sitting in our dining tent working on our journals, oblivious to the town around us when Dave had to go to his tent to get something and noticed kids walking by with lanterns. Expecting this was not a nightly occurrence and that something special was up Dave and I followed them down the hill to the school where a chaotic school festival was underway. Tinny and upbeat peruvian music was playing from a makeshift audio system, kids were all over the place: running around with lit lanterns, in the classrooms making lanterns from paper and bamboo, chasing each other, dancing, and who knows what else. Dave and I were keeping in the shadows trying to figure it all out when I finally noticed an adult tending to the inkling of a bonfire. I approached him and with my limited Spanish found out it was the school’s 37th Anniversary. Also, because of rumors of a Farmers Strike where roads get blocked and much of the country shuts down they were celebrating the Solstice which was only a few days away (many of the teachers come in from smaller neighboring towns and might not be able to make it to Patacancha). Once my Spanish was clearly exhausted the man I was talking to indicated to wait a moment and he dashed off into the darkness and fray of scurrying children (some of whose torches were now ablaze) and brought back Jeanne, a beautiful blond Dutch woman who spoke great English and Spanish. Jeanne was a delight to talk to and had only been in town for a week of her two month volunteering stint and has been loving it. She learned Spanish while living in Spain, then came to Peru and when she finished the Lares Trek, she became fascinated with the weaving culture in Peru and sought to come back to Patacancha to learn more. She’s staying with a family, working at the school, studying local weaving techniques and twice a week heads down to the larger town of Ollantaytambo to work at the medical clinic. She’s doing this through the program Awamaki.org – I gave her my email and I’ll post more here if I hear from her. Rob, having noticed Dave and I were gone for some time came down for a look himself. We were still chatting with Jeanne when Rob arrived but we were soon swooped up by the man I originally spoke to into a dancing circle with a bunch of the kids around the fire. It was such a blast and we were reluctant to leave, late for the dinner Rosalio made us, though the party was winding down. The next morning we hoofed it down the road to the next town, Huilloc (Willoc) where there is a knit & woven goods market. The building was locked, but Guido found someone to open it for us and we had a good browse through the hats, bags, ponchos, mantas (a woven piece about the size of a place mat, sometimes used as an offering blanket), and lots of other pieces. I had what I needed from Magarita, but Dave and Rob found a number of items of interest. From here, we hired a van to take us down to the town of Ollantaytambo where we had a room reserved and train tickets for the next morning to head to Machu Picchu. This entry is filed under: Blog, Earth, Hike, South America, Video.